Creating gift baskets has been our livelihood and business for the last 13 years, and we’re always on the lookout for new types of gift baskets and gourmet goodies to include in them. We love to receive feedback from our loyal customers, and we noticed that more and more shoppers were asking for dinner gift baskets, filled with all the fixings for a delicious night in. We value this great feedback, and lo and behold, we’re happy to announce the addition of our new Meal Gift Baskets section! We taste test all of the tasty treats inside our gift baskets (and oh yes, we love our jobs! ), and we were licking our lips over the delicious appetizers, dinners, and desserts in our meal gift baskets. Let’s take a gander at some of our most popular meal gift baskets so far – but be sure to check back soon, as we’re always adding more! Grandma’s Pantry Meal Gift Basket – Grandma always seems to have a little of everything in her pantry, doesn’t she? This is a robust gift basket that’s perfect for a big family, or a hungry one! It starts out with mozzarella cheese bars and baked potato soup, and transcends into an evening of angel hair pasta and gourmet sauce, a make your own pizza kit for eight slices, lemon bars, blueberry muffin mix, hand decorated cookies, and Irish crème coffee! We think that’s enough food for dinner for even two nights! 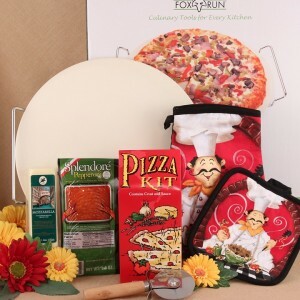 Gourmet Pizza Making Kit – A love for pizza tends to be that common dominator connecting most of us. Our make your own pizza kit features a mozzarella cheese bar, pizza kit for eight slices, sliced pepperoni, pizza stone set, an oven mitt, and an oven hot pad. It’s so much fun to make pizza at home and create your own topping varieties, and we think it’s just the thing for couples and families to bond over! Hearty Chili Fixins Dinner Gift Basket – Enjoying a bowl of chili on a frosty winter day is so welcome! This meal gift basket includes two biscotti, corn bread, chili fixins, Wisconsin cheddar cheese triangles, gourmet crackers, amaretto cheesecake cheeseball dessert mix, hand decorated cookies, and vanilla crème coffee. Now simply enjoy watching the snow gently fall outside your home’s windows as you relax with a great meal and your loved ones! Soup Bones Meal Gift Basket – Meal gift baskets are such a practical holiday gift idea, and if your gift recipient has a dog, include Fido in the gift, too! This soup-themed holiday gift basket includes roasted corn chowder soup, Wisconsin cheddar cheese triangles, wheat wafers, and a seasonal drink mix for the owner, and fresh, hand iced gourmet dog biscuits for Fido. Now the pooch in the family can have a treat to snack on while the rest of the family is enjoying soul-warming soups! Meal Gift Baskets are going to be a popular holiday gift this year, as the gift of dinner is always a wonderful gift to give and receive. Our lives are so busy these days, so receiving a basket full of all the fixings for a hearty night in is the start of one fantastic evening. Happy holiday shopping from all of us at BisketBaskets.com! What will you get the special guy in your life this holiday season? Another tie? A shaver? Golf clubs? 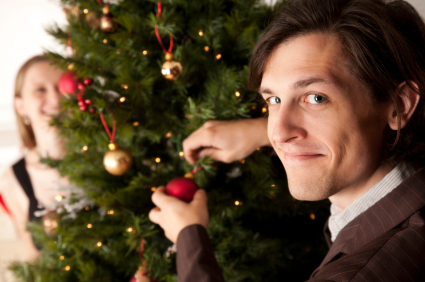 Most guys have almost everything they need already, and it can be hard to find a gift for him that he’ll actually use. Gift Baskets For Men are ideal for the guy in your life who “has it all” already, and can benefit from some delicious gourmet meats, barbecue sauce, and chocolates (a.k.a – every guy out there!). Don’t worry – we’ve designed our gift baskets for men to be “guy-friendly” in presentation, so you’ll feel confident gifting it to him! Gourmet Pizza Making Kit – The way to a man’s heart? Through his stomach, of course – with our gourmet pizza making kit! This robust kit is filled with a pizza kit to make eight servings of pizza, a mozzarella cheese bar, sliced pepperoni, oven mitts, and a pizza stone. He’ll just have to have you over for dinner! Blue Ribbon BBQ Gift Basket – We know plenty of ladies who enjoy barbecuing, but we also know that guys tend to love being masters of the grill. Give him a gift basket worthy of a grade A steak, filled with various types of bbq sauce, rib rubs, seasoning, almonds, cookies, sausage, and more. Time For Him Gift Basket – We lead busy lives these days, and we bet he could use a little time for himself. This gift basket comes filled with caramel popcorn, Wisconsin cheddar cheese, wheat wafers, walnut fudge, and a seasonal drink. Add in a gift certificate to the local movie rental store, and he’ll be set for a relaxing night in! Gentleman’s Gourmet Gift Basket – When we designed this gift basket, we took into consideration all the gift basket goodies guys like – barbecue sauce, smoked salmon, gourmet mustard, summer sausage, pretzels, Irish crème coffee, and more. We packaged it in a more masculine basket that he can use for everything from his magazines to his fishing supplies – and topped it with a neutral bow. T-shirt from his favorite watering hole or business – it shows you pay attention to what he likes! Make this your favorite year of holiday gifting by taking some time to browse through our gift baskets for men collection and select just the perfect one for him. Pair it with a “just for him” add-on, and he’ll love the thought you put into a gift that he can actually use and love!